As your hi-fi system grows, proper storage of your components becomes increasingly important. Even with a small system comprised of one or two units, correct storage of your hi-fi is a must to get the best from your equipment and even to prolong its life. Plenty of dedicated furniture exists to house systems of all shapes and sizes, though they vary widely in price, features, style and quality. Cheap racks such as this or This offer a good basic support, though they won’t safely support a significant amount of weight, nor will they support large components. This Norstone Bergen rack is a great option, though the three-legged design can interfere with the connections on deep components. Higher end racks can set you back anywhere from £300-£700, while a bespoke rack can run into the thousands. I was recently in a position where I needed to replace my existing rack. I had a few specific requirements. The rack should be rigid and strong with the ability to hold deep components. I wanted something with 6 shelves, neat cable management and the ability to easily add another shelf if required. It also needed to look nice, ideally matching the Ikea Kallax vinyl shelving. A good rack should achieve a few things. Good airflow between components is a must. Stuffing your components into an enclosed cabinet will trap the heat, possibly resulting in premature component failure. This is particularly true for large amplifiers, especially if you frequently push them hard as I do. Secondly, the rack should isolate the components from one another as well as from airborne vibrations and vibrations transferred through the floor. A good rack should be strong enough to support more than the weight of your system. Pushing a rack to its limits is a bad idea. A collapsing rack will destroy a system in a matter of seconds, and could cause serious injury to anyone standing near by. Never underestimate the weight of your system, and treat safety as a primary consideration. There are also many philosophies governing hi-fi rack design. Some believe that high mass designs are preferred, while some are firmly in the opposite camp. Some say that rigidity is important, while some will de-couple each shelf for maximum isolation. Some believe that the materials used can have an impact on the performance of a system and thus there are racks made of glass, soft and hard woods, composite materials and even stone, both real and artificial. There is no right or wrong answer. I personally believe that any strong, sturdy hi-fi rack will be ‘good enough’. My preference to avoid glass has more to do with the chore of daily cleaning than anything else; glass is a magnet for dirt. I wanted to avoid a high mass design as the rack is placed on a suspended floor, and the components themselves add more than enough mass to the overall structure. With all this in mind, I began looking at my options but it soon became clear that if I wanted a rack to meet all of my requirements, I was going to have to shell out for it. A lot. Anywhere from £700-1700, the price of a new component or a huge pile of records. Having been down the DIY route with previous racks I decided to do so again. Friday 24 February saw me visiting the yearly hi-fi trade show in Bristol (an event I don’t frequent). Five minutes down the road is an Ikea furniture store, a world of one-way walkways, aisles of flat-packed product and Swedish meatballs. It was to Ikea I turned for inspiration, fostering a vague hope that I may have somehow missed a suitable piece of furniture while trawling their website weeks before. Though every cabinet, shelf and table in the store was either too small, too wide or too enclosed, the £5 Lack coffee table spotted on the way through the collection point offered some much-needed inspiration. A quick google later revealed a number of hi-fi racks constructed using these tables, which consist of hollow legs and a hollow framed top filled with a honeycomb paper material. Measuring 555 x 555 mm with roughly 455 mm between the legs, these tables are the perfect size to house a traditional hi-fi component or a large turntable. They weigh in at 3.93 kg in stock form. Each table is rated for a maximum load of 25 kg, about average for a typical rack shelf. I put this rating to the test by assembling and standing on a Lack table which didn’t collapse. Jumping on the table yielded no movement either. Being a tall and relatively well built person, I scientifically concluded that if the table can hold me, it’s man enough for a hi-fi component. I purchased 6 tables. The legs would be cut to the desired shelf height, with their hollow ends filled with timber. The legs would be screwed to the tables in the usual way that Ikea intends using the screws they provide. The tables with their shortened legs would then be stacked, with wooden dowels to hold everything in place, much like the construction of Ikea’s own furniture. You’ll need a couple of things to build your own ‘Lack Rack’. Purchase as many tables as you need shelves, though be mindful that the table tops themselves are 48 mm in thickness. Six tables makes a pretty tall rack, though it’s still low enough that a turntable on the top is easy to cue. If you need more shelves, build 2 racks and place them side-by-side. You’ll need some sawn timber available from any good builder’s merchants or DIY store. 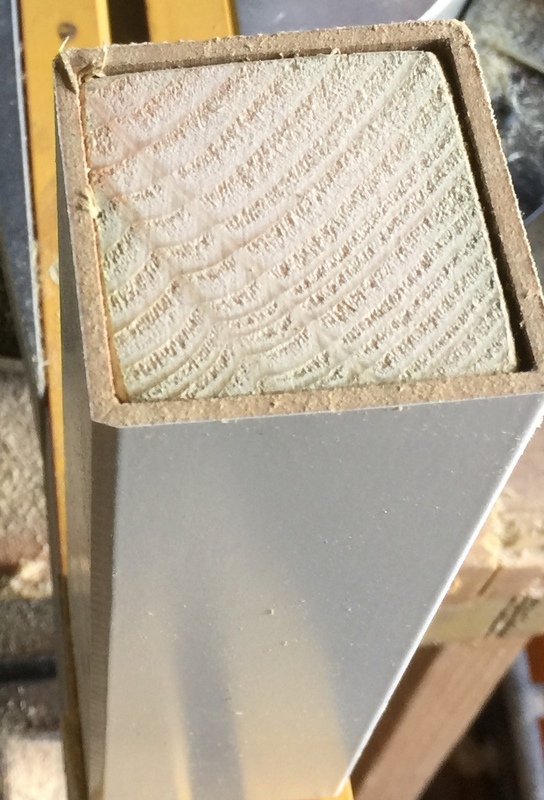 The inside leg dimension is 45 mm squared, and you want your timber to be a tight fit. You’ll also need some wooden dowels at least 30 mm in length, available from any DIY or hardware store. Tools required are a saw (preferably a powered chop saw with accurate alignment guides), some sandpaper, a drill with 6 and 10 mm drill bits and a hammer. A couple of clamps are also required, as is a flat wood off cut for use in step 1. To get started, the pre-drilled pilot holes in the tables must be drilled through the top surface. Drill one less table than you have; if you’re building a four shelf rack, drill three. I was building a six shelf rack so I drilled five, wanting to leave the surface of the top-most shelf intact. Clamp a spare piece of wood to the top surface of the table covering the hole to prevent the surface splitting and carefully drill the pilot hole the rest of the way through using a 6 mm drill bit. Next, prepare the legs. Cut your legs to the desired length, which is the desired distance between the shelves. Measure from the flat end of the leg where the pilot hole is pre-drilled into the end of the leg. This is the end you’ll be using. Once cut drill out the pilot holes in the legs too, which will allow the air to escape when you fill the legs with timber. One of the tables doesn’t require its legs, so you’ll have a spare set of four. You may wish to wrap masking tape around the cutting area to prevent surface scratches, unless you’re using a power saw (recommended). It is imperative that your legs be precisely cut to identical lengths. Mistakes here will result in shelves being out of level when you assemble the rack. Next measure the internal length of your legs between the end of the pre-fitted block and the top of the leg. 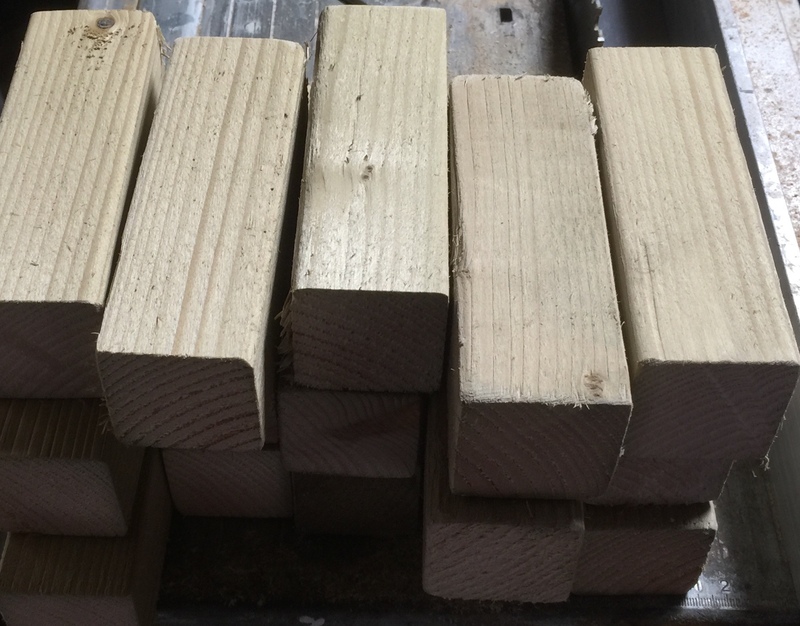 Cut timber fillers for each leg 2 mm shorter, and slide them into the legs, knocking them in as far as they’ll go. These shouldn’t protrude from the end of the leg. Next, fit the dowels to the ends of the timber fillers you just inserted. Draw two lines from the diagonal corners of each leg. Where the lines cross is your centre position. 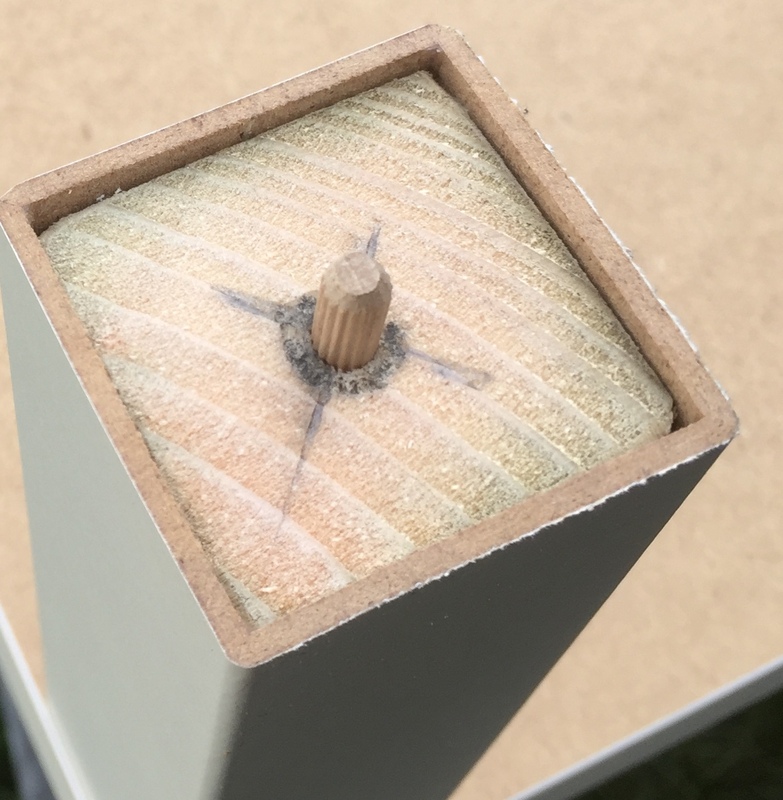 Drill a 6 mm dowel hole and insert the dowel, knocking it in until it protrudes 10 mm from the end of the filler. Screw the legs to the tables using iKea’s instructions. 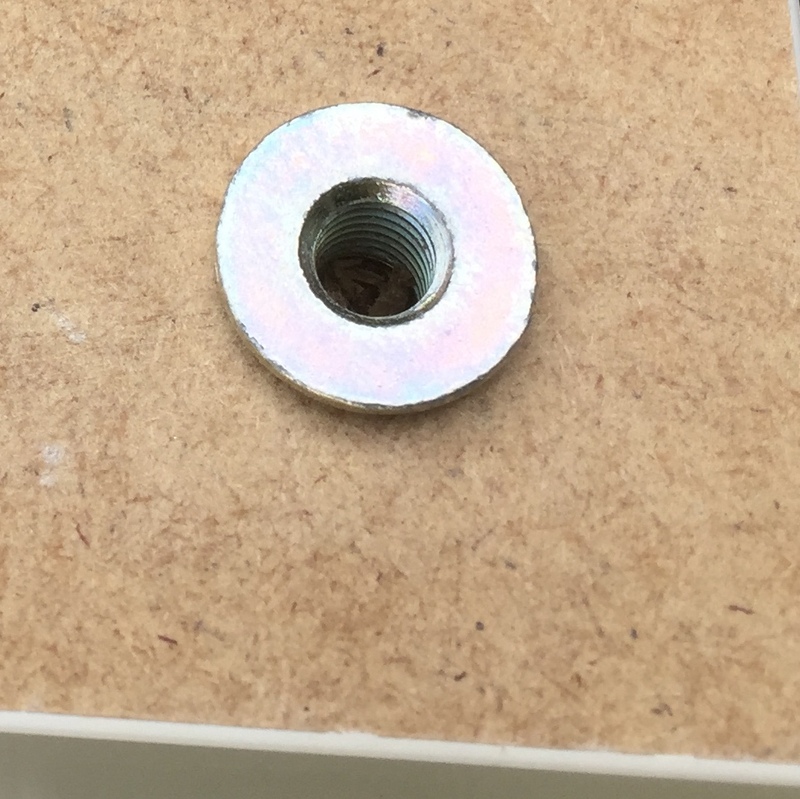 Insert one ended of the provided double-ended screw into the pre-drilled pilot hole on the leg, and the other into the bottom of the table. Rotate the leg until it is in position and until you cannot perform another full turn. They are tight. At this point, you should have a number of shelves with legs installed, and dowels on their opposing ends. One shelf (your top shelf) should have no holes in its surface, while your others will have holes to line up with your locating dowels. One spare table should have no legs – this is your base. In order to de-couple the rack to the floor, you’ll want to install some floor spikes. I purchased mine from QTA Systems. I used M8 spikes, knock in inserts and lock nuts as I had some left over from my previous rack. 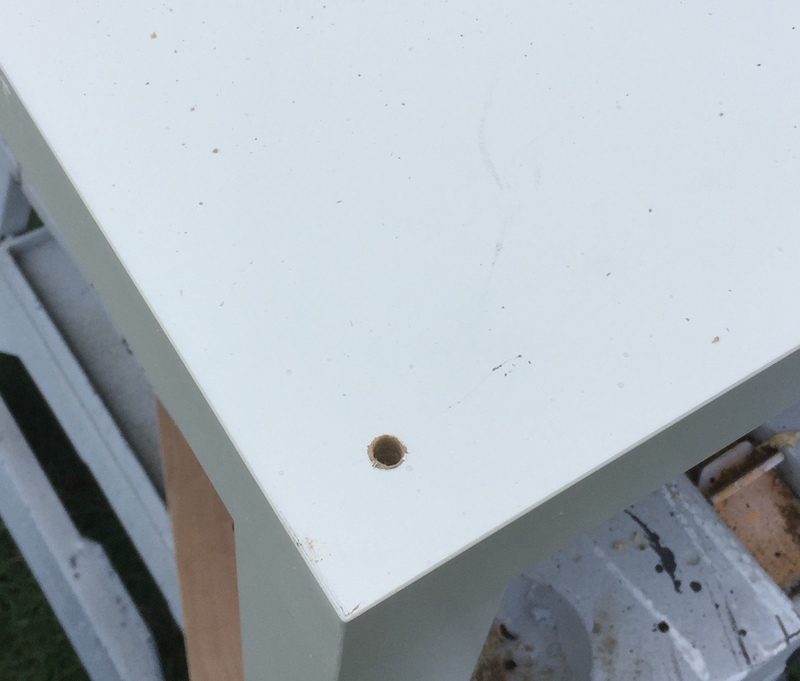 On the underside of your base table, drill out the existing pilot holes with a 10 mm drill bit roughly 30 mm deep and knock in your wood inserts. Screw a spike into each insert, and your base shelf is complete. To assemble the rack, place the base shelf in the desired location. If you’re situating the rack on a hard floor you may wish to use spike shoes to prevent damage to the floor surface. Level the base shelf in all planes using an accurate level, using lock nuts to lock the spikes in place. Once level, begin stacking the shelves. Locate the dowels into the holes in the surface of each table, and press them evenly into place. The tables should lock together with the gap between the bottom of each leg and the surface of the table below invisible. Finish with your top table which has no dowel holes in its surface. The result is a sturdy, great looking rack. The shelves are deep enough to support many of the largest components. Cables can be neatly hidden behind the legs. The rack weighs very little and can easily be lifted by one person when empty, but it’s extremely solid and won’t tip over once it’s weighed down with some hi-fi. Though the shelves are not de-coupled the isolation between shelves is excellent. And the cost? Just shy of £50 including tables, timber, dowels and spikes. The ‘Lack Rack’ might just be one of the biggest bargains in hi-fi yet. Hi Ashley, Well done, great idea! I made a 3 level rack for my daughter’s turntable. The only difference was that I re-used the insert blocks in the off cuts and, as the holes are already there, construction is even more simple. The thin MDF is easy to remove and the remaining bits are easily planed off the blocks to make them fit snugly. You didn’t say whether you glued the table components together or whether you left them so that the rack is demountable for moving and transport? Thanks Bruce. I did consider using the off cut blocks; my main reason for not doing so was that I didn’t want the legs to be hollow at any point, as mine holds some particularly heavy components. I didn’t glue the shelves together. I wanted the rack to be easily disassembled and easily adapted in future to accommodate more or fewer components. Plus I found that providing the dowel holes are suitably tight, the rack is very stable and as the components are all providing downwards weight it isn’t going anywhere. If I were to do this again I would probably use M6 metal dowels for that little bit of extra rigidity, but the wooden dowels work perfectly well. Ive made a tiered rack using this type of method. However a simpler and better sounding version of the rack can be achieved by replacing those solid timber blocks with the smaller ones that terminate each leg. After shortening the leg I cut and cleaned up the small blocks then dowel and glued to leg. This method maintains the light but incredibly dense construction that is the secret asto why the Lack is such good support for hifi. I own a £150k Audio Note system and nothing that Ive tried so far has bettered the Lack sonically. Interesting. I wonder why leaving the legs hollow would result in better sound. My reasoning for adding the extra timber was to rule out any excessive resonance caused by the hollow legs and add that little extra bit of strength to the legs as my components are heavy. The timber didn’t add too much weight; very little in fact. Out of curiosity did you try both methods to see if there was a sound difference? You’re welcome, let me know how it goes if you attempt it yourself. Mine has been standing for months with no issues, it really is a great rack. The units you describe must have been the taller version of the basic kitchen base carcasses I mentioned above and still have in the man-cave today! Back in the day my LP12 was supported by a dedicated square section triangular-braced and spiked black metal wall shelf by Target, similar to the current Rega design. 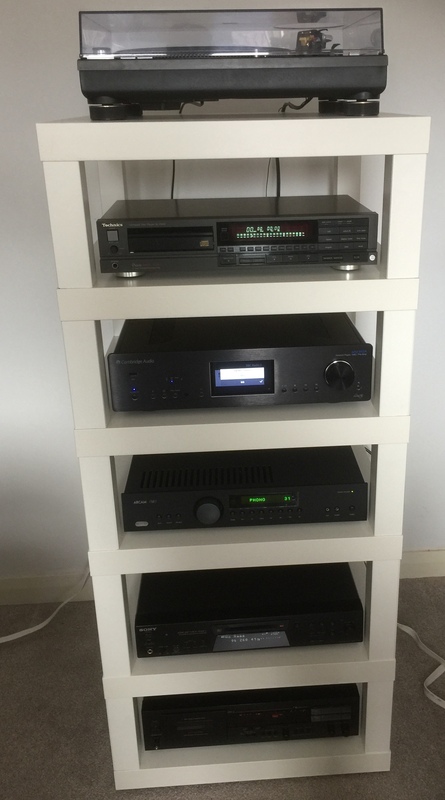 At that time I was a Linn afficionado, hanging on Ivor’s every last word…but no more! Ikea did, and still do, make a wall shelf version of the Lack, but it wasn’t wide enough for my needs, nor was it very deep. I have a wall-hung TV, and I hid the wiring to/from in a plastic conduit which I covered with wallpaper to match, so it is barely visible, but I assume you have thought of and rejected that idea. Anyway, I’ll get back to listening to my 440!! Conduit is a great idea, I must get around to buying some. I plan to buy the large rectangular variety, like that commonly used in PC networking to install mains sockets and network outlets on the walls. I’ll notch two corners around the rack legs and install it such that there is a sufficient hole in either end for the cables to travel to / from. This will provide ample space to hide the cables and power strips. The interconnects are purpose made to be just the right length, and they tie up neatly behind the legs so I don’t need to hide those. I have a spare set of legs from the rack build and I’m planning to build a square frame using those to support another Technics 1200 on the wall, a bit like the wall shelf you mention but not triangular as the Technics has 4 feet and is pretty heavy. Glad to hear you’re enjoying the 440 by the way, I did see the comment on the 3600LE post but but totally forgot to respond, apologies for the oversight. I bet that sounds fantastic with a few more hours on it. Very clever Ashley. Six years ago I used two light oak Lack tables with cut-down legs to support some cheap (Ikea) light oak kitchen base storage cabinets, raising their level to the same height as an Ikea light oak CD rack, all of which support a model railway baseboard. Ikea light oak Billy bookcases (also of exactly the same height) continue the baseboard round the next wall of my L-shaped end-to-end layout. This support has stood the test of time, remaining completely level, and sits around the periphery of my (mainly Hi-Fi and TV) man-cave. My (twice-decoupled) turntable sits on top of a heavy Billy light oak six-drawer bedroom chest upon composite flooring, and as a consequence does not suffer from any footfall disturbance whatsoever. It’s amazing how many Ikea products can be utilised for projects other than that for which they were designed, so well done Ashley; I’m sure your many readers will thank you for sharing your ingenuity. Thanks John. I had initially thought of using a 1450 mm high, 600 mm wide larder unit, the type usually used to contain an integrated fridge. However that brought with it a couple of issues. Firstly cable management would be a nightmare owing to the enclosed sides and the fact that my rack sits up against a wall. Secondly the units don’t have a solid top so one would need to be made, and the back of such a unit would need to be strengthened either using a timber framework or a solid backing board, which could restrict airflow. And lastly the unit was too tall, making cuing a turntable difficult. I recalled that back in the day the Ikea table came highly recommended as a support for the Linn LP12. While I don’t own an LP12, and never will, most turntables will benefit from being placed on a low mass structure and the Ikea system is ideal. It really is amazingly solid. I’ve lifted a fair few components on and off of it now and everything is so easy to get at. I need to add something to hide the power strips. I may experiment with building a wall shelf version as I’d like to add a second turntable to my system but don’t have enough floor space for a second rack. I’m trying to find a contact within Ikea to send the designs to them as a product suggestion but haven’t had much luck yet. I may try their customer services at some point as a last resort. Either way, a fantastic way to spend £50.